Please stop by the Red Thread Advocates blog to read Becky’s wonderful review of my book! If you have read my book, please consider taking the time to write a review on Amazon or recommend it to friends you have who are considering adopting from China. I worked really hard to make it an all-inclusive resource and I appreciate your support. That’s Mag offers an explainer on the origin of China’s famous split crotch pants for children. South China Morning Post – The Chinese divorce rate has risen almost 30% in 3 years. Elizabeth at the Ordinary Time blog posts Attachment Tips, four things she wishes she had done when she began adopting. Caixin Online- Hidden Lives is a photo essay looking at people who have HIV+ in Henan. Many of these people contracted HIV when the government encouraged people to begin selling blood. They did so in order to raise the standard of living for their family, to afford a better education for their children. This photo essay does feature a few people who became HIV+ in other ways. Because of the huge stigma against HIV in China, most will have a difficult time earning a living, receiving health care, or finding a school to educate their children. China is only slowly beginning to prepare files for HIV+ children. You can read more about China’s orphans with HIV here. CCTV America released an article on how many career women in China have no desire for a second child, and many don’t want to have a child at all. The BBC has an article about how the “fertility police” are now being retrained to help families learn better parenting skills. It has a long discussion of fertility police tactics which were used to enforce the one child policy. 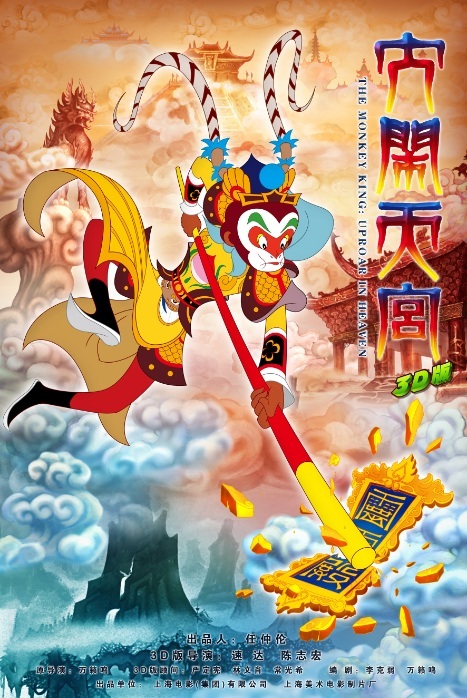 We recently watched the animated movie The Monkey King: Uproar in Heaven. I believe this is a 1965 cartoon which tells the story of the Monkey King from Journey to the West. We watched it on Amazon Prime with English closed captioning turned on. We all enjoyed it, often laughing at the silliness. It’s a great way to become familiar with a Chinese cultural classic during the year of the monkey. However, I would rate it PG due to mild language (damn, hell), drunkenness, and possible drug use (I’m not really sure what those golden pills the monkey took from the Emperor’s pharmacy were). This entry was posted in Uncategorized and tagged What I'm reading on May 10, 2016 by minefam.